...as a separate download. Timing couldn't be worse, personally. But I'm glad it's finally out. Found in Mr. Rittman's stream. 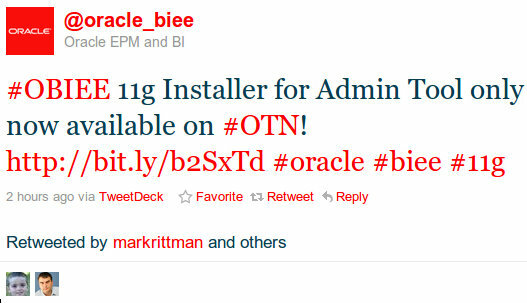 I've complained a lot about the 11g version of OBIEE, perhaps not here a lot, but trust me, I have complained. I don't mind the integration with WebLogic, I understand that move. It's just so darn...well, it's just painful. This move rectifies part of it, the install process. Before this, you had to install the entire stack and then disable the services...just to get the Admin tool. Find the download page here. README is here.